One popcorn popper that is a fairly simple improvement on just using a regular cooking pot on the stove is the stovetop popcorn popper. 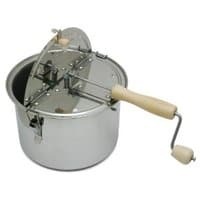 These have a stirring mechanism that rotates around the bottom of the pot moving the kernels and distributing them and the oil evenly. This action decreases the number of unpopped kernels known as "old maids". It also keeps the popped flakes from sticking to the bottom of the pan and burning. This makes it easier to make great popcorn on the stovetop. Clearly the most popular, and arguably the best, stovetop popcorn popper is the 30-year-old Whirley Pop Stovetop Popcorn Popper . You will find a detailed description of this stovetop popcorn popper on the Whirley Pop page. The Whirley Pop is one of the least expensive stovetop popcorn poppers. The Cook N Home Stainless Steel Stovetop Popcorn Popper is a medium priced popper. It has a 6.5 quart capacity, has metal gears, and is made of stainless steel with a clad bottom. A relatively expensive stovetop popper is the Lindy's Stainless Steel Stovetop Popcorn Popper . It is a well built popper with a 6 quart capacity, metal gears, and is made of heavy gage 304 stainless steel with a clad bottom. This is the stovetop popcorn popper I use because it has one other feature which is very rare and critical to me. It works on an induction cooktop. It was the only popper that specified that it would work with any type of stove top, including smooth top and induction. So if you're fortunate enough to have an induction cooktop, this is your baby. Essentially every stovetop popcorn popper has stirring mechanism in common. This stirring mechanism is "powered" by a person turning a crank of some type. In addition to the stirring mechanism nearly every stovetop popcorn popper has at least one "door" in the lid that can be opened to dump out the popped corn. All stovetop poppers also have vents in the lid to allow the steam to escape keeping the popcorn dry and fluffy. 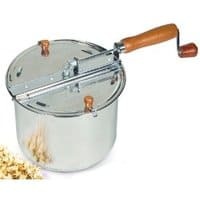 Since the design of all stovetop popcorn poppers is very similar, the primary factors that differentiate one stovetop popcorn popper from another are its overall quality and the material from which it is constructed. 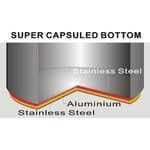 The lower cost models are made from a relatively thin aluminum. More expensive models are made of stainless steel. These are more durable and better looking. Some have a clad bottom which has the advantage of distributing the heat more evenly over the bottom of the pan. The lower-end stovetop poppers usually have gears made of plastic in their stirring mechanisms. Normally the high-end stovetop popcorn popper will have medal gears.